This study aims to examine the uptake and translocation of Cd, Cu, Fe, and Pb in different parts of three roadside plant species grown in the semi-urban of Jengka, Pahang, Malaysia. Heavy metal concentrations were determined from various parts of Athyrium esculentum (AE), Chromolaena odorata (CO), and Lantana camara (LC). The bioconcentration factor (BCF) and translocation ratio of heavy metals from soils to plants were estimated. Fe showed the highest metal concentration determined (< 850 mg kg−1), while Cd showed the lowest metal concentration observed (< 0.12 mg kg−1) in all plants. Heavy metal concentration in the roadside plants was higher than metal determined in the same species from an uncontaminated site. Principal component analysis (PCA) suggests anthropogenic and natural sources of heavy metal. Plant roots slightly enriched by Cd and Pb (BCF < 1), while the leaves absorbed and accumulated Cu and Fe (BCF > 1). The translocation ratio of four metals suggests that absorption of the three plants had the rank: root > stem > leaves. The metals in the root zone transported weakly to the stem but more strongly mobilized to leaves when available in the stems. A comprehensive study of heavy metal concentration in a variety of roadside plants in the tropical area should be done in the future ensuring the precise source and translocation mechanisms. Heavy metals can accumulate and migrate in the soil environment. Metal pollutants in soil may be absorbed by the plants through their roots and vascular system. Accumulation of metals in soil could affect the ecosystem safety and pose a threat to animals, plants, and human. High concentrations of metals in the plant could inhibit the ability of the plant to produce chlorophyll, increase the plant oxidative stress and weaken stomata resistance (Ashraf et al. 2011). Unnatural occurring heavy metals such as chromium (Cr) and cadmium (Cd) may suppress the growth of a plant, whether the pollution comes from soil or air (Street 2012). Perhaps heavy metals can enter human bodies via the food chain, leading to incremental of chronic diseases such as cancer (Muller and Anke 1994; Ramadan and Al-Ashkar 2007) and affecting the central nervous system, particularly in children (Zhao et al. 2009). Plants growing at the roadside may be exposed to high levels of metal pollution, especially vehicle emissions and trace content in the air. Feng et al. (2011) suggested heavy metal from traffic emission may accumulate in roadside plants from the soil. Meanwhile, other researchers reported airborne heavy metal could be deposited and absorbed on the leafy part (Nabulo et al. 2006; Shahid et al. 2017). Cadmium (Cd), copper (Cu), and lead (Pb) may originate from tires, engine oil consumption, brake wear, and road surface material (Chen et al. 2010; Zhang et al. 2012; Ugolini et al. 2013). Heavy metals from traffic activities could accumulate in the soil before being absorbed by plant roots. Since heavy metals are resistant and stay in the plant for a long time (Boularbah et al. 2006), they may be transferred to humans via the food chain (Zhang et al. 2012). Bioavailability of heavy metals is primarily affected by the soil’s physical-chemical properties (Liu et al. 2007) and plant species (Koz and Cevik 2014; Keshavarzi et al. 2015; Zhao and Duo 2015). Some species of roadside plants are edible while some other are used for medicinal purposes (Chandrashekara and Thasini 2016). Certain species such as Athyrium esculentum (AE) are edible (Roslan et al. 2016), and Chromolaena odorata (CO) is known to be used for medicinal purposes. Muhammad and Mustafa (1994) reported that CO could stop bleeding by pounding the leaves until fine and mixed with some saliva and applied to the wound. Recently, researchers have focused on the significance of soil types, uptake, and accumulation of heavy metal in the natural conditions as well as in anthropogenic sites (Nabulo et al. 2006; Khan et al. 2011; Galal and Shehata 2015; Zhang et al. 2016). Interactions between different elements possibly lead to different harmful effects on an ecosystem. Many studies related to roadside plants have been done in other regions such as Thailand (Tanhan et al. 2007), Turkey (Koz et al. 2008), Nepal (Zhang et al. 2012), China (Zhang et al. 2016), and India (Rai 2016). However, limited studies have been carried out on the fully grown roadside plants specifically in a tropical suburban region. No study has been undertaken to examine metal accumulation in roadside plants in Jengka, Pahang, Malaysia. Therefore, this pilot study was performed to determine the concentration of heavy metals in selected roadside plants and to investigate the accumulation and translocation of heavy metal within the selected roadside species. This study also attempts to identify the possible sources of heavy metal in roadside plants. Jengka is situated in the west of Maran district, in the state of Pahang, Malaysia. Jengka is surrounded by palm oil plantations, but in the last decades, the town center has grown to become a semi-urban area with many residential estates to cater for approximately 25,000 people. 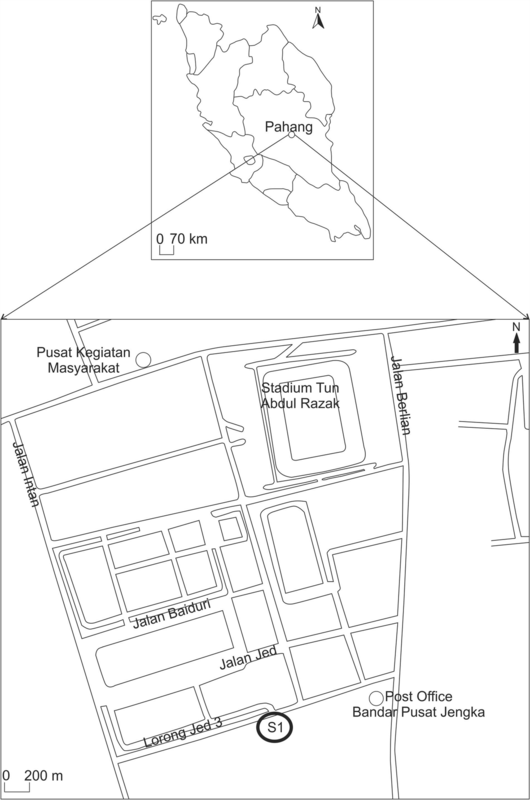 For this study, the sampling site is located at the main roadside of Jengka town (03°46′N, 102°32′E) and the road was built about 30 years ago. During peak hours, this station experiences a high-traffic flow, mainly on weekdays. Figure 1 shows the sampling location (S1) for this study. The roadside plants chosen for this study were Athyrium esculentum (AE), Chromolaena odorata (CO), and Lantana camara (LC) on the basis of dominant plants available in the study area. Additionally, AE and CO species are edible and used for medicinal purposes by the local community. Each plant was sampled with replicates (n = 9) within 30 m of the roadside. No bigger plant species available, and the sampling location was surrounded by buildings. Nabulo et al. (2006) suggested that plants that grow within 30 m of the edge of a road may expose to pollutants. The corresponding soils at 0–20 cm in depth were also collected and then placed in a separated polyethylene bag for transportation to the laboratory. The samples were taken during the dry season, between April and May 2014. The plants were separated into roots, stems, and leaves, and then rinsed with deionized water, dried at 60 °C for 24 h, ground up with an agate grinder, and homogenized. As a control, samples of the same species, with three replicates for each, were collected from an uncontaminated area, away from significant human activities such as traffic, and treated the same way as the roadside plant samples. A microwave digestion procedure was used. About 0.5–3.0 g of the homogenized samples were digested under pressure in Teflon vessels with 6 mL of nitric acid (HNO3) and 1 mL of perchloric acid (HClO4). On completion of the digestion and after adequate cooling, solutions were filtered through a membrane filter paper of 0.45 μm pore size (Whatman Millipores, Clifton, NJ, USA) and made up to 50 mL with 1% HNO3. The same procedure was utilized for soil samples. Cd, Cu, Fe, and Pb concentration were analyzed using graphite furnace atomic absorption spectrometry (GFAAS, Perkin Elmer PinAAcle 900T, PerkinElmer Inc., Waltham, USA). The relative standard deviation (RSD) for each metal repeated analysis was maintained below 5%. The detection limits for all elements were 0.4 mg kg−1 for Cd, 5 mg kg−1 for Pb, 30 mg kg−1 for Cu, and 850 mg kg−1 for Fe. A spiked sample using a known amount of metal standard was examined via acid digestion for verification of the accuracy of the analytical procedure. Recoveries of the heavy metals ranged between 85 and 110%. All reagents used were analytical reagent grade. A pre-cleaning regime, i.e., acid washed was applied for each glassware apparatus prior to use. High purity water (water sensitivity ~ 18.2 Mohms·cm at 25 °C; Millipore, MA, USA) was used throughout this study for laboratory applications including reagents, blanks, and standard preparation. Cstem or leaves is the concentration of metal in stem or leaves and Croot or stem is the concentration of metal in root or stem. The control used in EF estimation was the same plant species from the uncontaminated area. The reference element used for EF determination was Fe. A value of EF above ten is identified as anthropogenic sources of pollution whereas an EF value below ten is recognized as natural sources pollution (Fagbote and Olanipekun 2010). Lu et al. (2014) suggests the degree of metal enrichment (EF value) as minimal (EF ≤ 2), moderate (2 < EF ≤ 5), significant (5 < EF ≤ 20), and very high (EF > 20). The contamination factor (CF) was calculated by the ratio between the metals in the samples and the background value of the corresponding metal (Rajmohan et al. 2014). In this study, the CF calculation used the control sample (taken from the uncontaminated site) as the background value. The contamination factor was classified into four groups by Pekey et al. (2004), including low (CF < 1), moderate (1 ≤ CF ≤ 3), considerable (3 ≤ CF ≤ 6), and very high (CF > 6). The collected data were analyzed using Statistical Package for Social Sciences (SPSS version 21.0), and the statistical significance level was defined at p < 0.05. Principal component analysis (PCA), a multivariate analysis technique, has been applied to determine the possible sources of heavy metal in roadside plants. An eigenvalue greater than one was chosen to obtain the significant value for the principal component. Mustapha (2012) suggests the factor loading after rotation can be classified as strong (> 0.75), moderate (0.50–0.75), or weak (< 0.50). The absolute principal component score (APCS) method was utilized to quantify the contribution of each source to specific measured pollutants (Khan et al. 2010). The factor scores for the artificial sample were subtracted from those of each true sample to estimate the APCS (Mohamad et al. 2016). Then, the multiple linear regression (MLR) procedure was applied to estimate the source contribution, using metal concentration as a dependent variable and absolute score factors as independent variables. According to Mohamad et al. (2016), the PCA-APCS is capable to identify different sources and composition without any prior knowledge about the sources. The concentration of metals in different parts of AE, CO, LC, and soil samples collected from the study area are shown in Table 1. 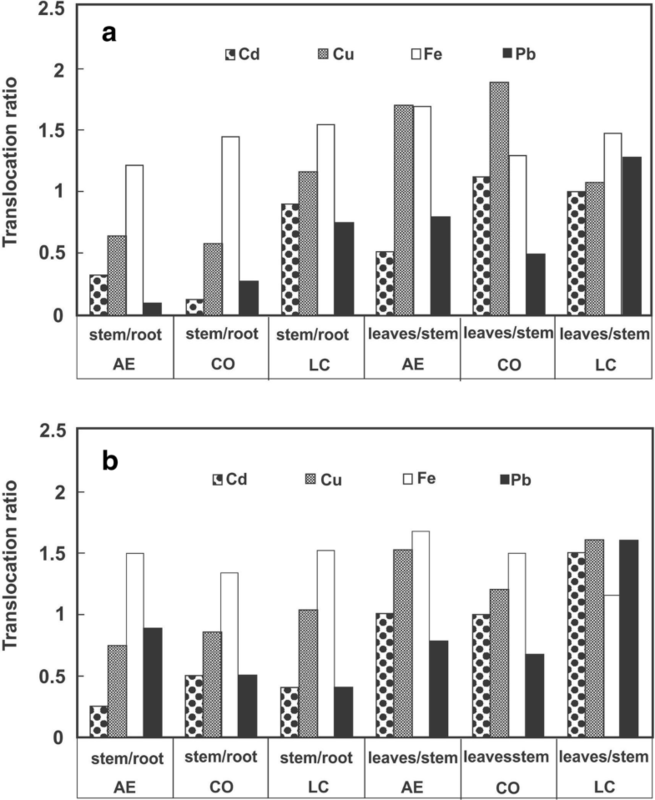 Roots tend to have a higher concentration of metals compared to the stems and leaves (Zhao and Duo 2015; Juen et al. 2014). Roots act as a barrier for metal translocation and protect stem and other plant parts from metal contamination (Liu et al. 2009). However, this study found Cu and Fe concentrations in stems and leaves to be higher than those in the roots of all plants studied. From Table 1, all plants showed the same Fe distribution with increment concentration order of roots < stems < leaves. For sample collected from the roadside, Fe concentration from roots had a range from 265.30 ± 83.72 to 496.50 ± 27.01 mg kg−1, while stems and leaves were ranged from 322.25 ± 18.87 to 580.50 ± 13.29 mg kg−1 and 545.15 ± 31.32 to 841.60 ± 8.62 mg kg−1, respectively. As for the control sample, Fe concentration also showed the same trend of increment from root to leaves except for AE species. Fe will be absorbed by the roots in the form of free ions. From the roots, this element can be detected in the stems since for the transferring process of the minerals to the shoot has to pass through xylem and phloem that located in the stems. Fe acts as an important element in a photosynthetic process that occurs in the chloroplast. Since chloroplast is found in the green part of the leaves, Fe will mostly accumulate there. The high Fe concentration indicates that there are metabolic activities that happen in the leaves. All of the processes needed for photosynthesis such as absorption of sunlight and transpiration will increase the concentration of Fe in the leaves (Frossard et al. 2000). Leaves contain the highest concentration of Cu followed by roots and stems for all plants in the roadside sample (Table 1). On average, LC contains the highest Cu concentration (> 21 mg kg−1), followed by CO (> 12 mg kg−1). The lowest Cu concentration was discovered in all parts of AE with the concentration of more than 10 mg kg−1. The control samples showed the same trend of Cu concentration, however, with lower concentration. According to Tanhan et al. (2007) and Aiyesanmi et al. (2012), CO, which also known as Siamese weed, has a high ability to absorb heavy metal. Since it is a widely growing plant and resistant in the environment, the level of absorption of heavy metal will also increase (Aiyesanmi et al. 2012). Nonetheless, Cu is required by the plant tissue for the growth process. In this study, roots showed the highest concentration of Pb ranging from 2.64 ± 0.43 mg kg−1 to 3.79 ± 0.19 mg kg−1 for roadside sample and from 0.50 ± 0.11 to 1.00 ± 0.05 mg kg−1 for control sample as seen in Table 1. The concentration of Pb from plant stems ranged from 0.33 ± 0.04 to 2.25 ± 0.03 mg kg−1 and leaves were 0.26 ± 0.03 to 2.86 ± 0.15 mg kg−1 for the roadside sample. Meanwhile, for the control sample, Pb concentration in stems was 0.45 ± 0.03 to 0.61 ± 0.08 mg kg−1 and in leaves were 0.31 ± 0.03 to 0.35 ± 0.02 mg kg−1. Pb has a long soil retention time and can stay in the soil for about 150 to 5000 years (Shaw 1990). Therefore, the probability for this metal to be absorbed will become higher. Pb does not naturally occur in the plants and can be very toxic if being consumed in high dose (Tuzen 2003). The high level of Pb concentration in all part of plants is primarily caused by the accumulation in the soil. The anthropogenic activities such as vehicle emissions (residual from the exhaust, tire, and brake wear) occur around the area perhaps enhancing the soil Pb concentration (Aiyesanmi et al. 2012). Malaysia has banned the use of lead in gasoline around 20 years ago. However, the leftover Pb can still be traced. All of the three plants have a higher concentration of Cd in roots (≤ 0.11 ± 0.00 mg kg−1) than stems (≤ 0.09 ± 0.01 mg kg−1) and leaves (≤ 0.09 ± 0.01 mg kg−1) as seen in Table 1 for the roadside sample. For the control sample, the same trend is observed. Cd could occur naturally when it is bound with another metal (Khan et al. 2011). The LC species showed high Cd concentrations in all parts compared to AE and CO plants. Perhaps LC has more ability to absorb Cd from soils than other plants (Dissanayake et al. 2002). If the AE and CO plants are consumed, e.g., for medicinal purposes, they must be considered safe based on the limitation set up by Malaysian Food Regulations (1985) except for Pb in roots for the roadside sample (Table 1). For LC, the Pb content in all parts of this plant exceeded the guideline value; fortunately, this is a non-edible species. However, all plants exceeded the recommended value for Pb fixed by Food and Agriculture Organization/World Health Organization (FAO/WHO 2016) except for leaves of AE species in the roadside sample. Table 2 shows the comparison between heavy metals in roadside plants obtained in this study with heavy metals in roadside plants reported from previous studies. The Pb and Cd concentrations were lower than that of roadside plant samples collected from Kanchanaburi, Thailand (Tanhan et al. 2007), Akure, Nigeria (Aiyesanmi et al. 2012), and Pontian, Malaysia (Roslan et al. 2016). However, Fe and Cu concentrations were higher than in the other study area in India (Rai 2016). This may be due to different anthropogenic factors such as industrial activities, population and settlement patterns, and differences in traffic density. The levels also depend on the soil concentrations of those heavy metals that are available naturally. Furthermore, heavy metal concentrations in roadside plants were higher than the concentrations in the same plant species from the uncontaminated area. This gives us an indication that human activities (traffic) do influence the metal concentration in the plants. Perhaps high-metal concentrations were found at those sampling sites where human activities are more intense. Table 3 shows the EF level of each metal from three different roadside plant species. Results showed that the EF value is less than ten, with values less than two indicative minimal enrichment. LC species showed the highest enrichment for Cd (2.59), followed by Pb (1.74) and Cu (0.74). AE and CO species also revealed the rank of EF value Cd > Pb > Cu. Table 3 indicates the CF in the study area ranges between 2.23 and 2.66 for Fe, 1.65 and 2.29 for Cu, 2.15 and 3.88 for Pb, and 4.0 and 5.8 for Cd. The roadside plant samples in this study are range from moderate contamination to considerable contamination of selected metal based on Pekey et al. (2004) classification. This gives a hint significant portion of metals which have originated from non-crustal source or anthropogenic processes, especially for Pb and Cd. Table 4 shows the results of the varimax rotated factor analysis for heavy metal in roadside plants. Two key factors were identified in the overall dataset (94.39% of total variance). Factor 1 with 57.86% of the total variance showed a strong loading for Cd and Pb. These elements can be categorized as originating from anthropogenic sources such as motor vehicles (Aiyesanmi et al. 2012; Zhang et al. 2012; Khan et al. 2011; Chen et al. 2010; Koz et al. 2010; Tuzen 2003). Moreover, the sampling point was located at the main roadside of Jengka town which is exposed to heavy traffic activities especially on weekdays. The second factor (factor 2) was found to show a strong factor loading for Cu and Fe with 36.53% of the total variance. Fe is an element which is present in soil and the earth’s crust (Shaw 1990; Koz et al. 2008), while Cu could come from traffic activities (Ugolini et al. 2013). Therefore, metal elements in factor 2 perhaps contributed by a mixture of natural and anthropogenic origin. The absolute factor scores were regressed against metal concentration using MLR analysis to apportion the percentage mass contribution of each identified source. The contribution of the possible sources of different elements in the plant is presented in Fig. 2. 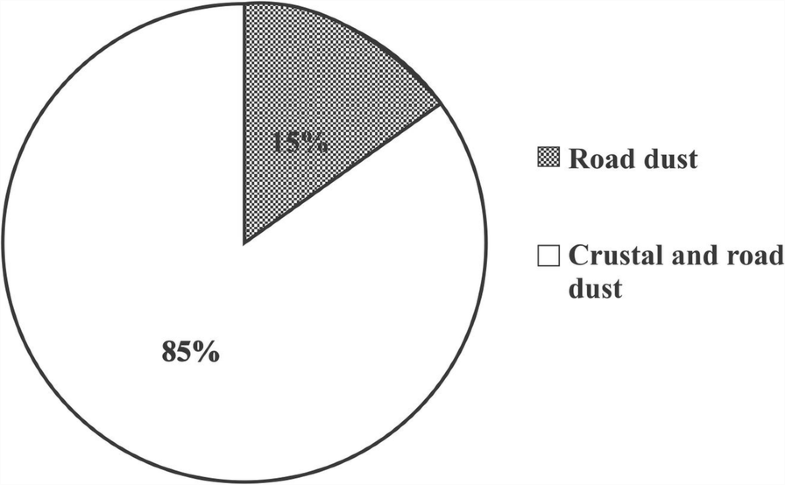 The main composition was dominated by natural and was coupled with road dust sources with 85% contribution. The other source was road dust due to motor vehicle activities (15%). This analysis suggests that the possible sources contributing to the range of metal elements in the roadside plant was traffic activities, apart from the natural crust. Figure 3 shows the BCF values for Cd, Cu, Fe, and Pb in all plants. For the roadside samples, BCF value of Cu in the roots, stems, and leaves for all plants exceeded value 1.00. This indicates all parts, roots, stems, and leaves can absorb and accumulate Cu. A similar pattern has been observed for Fe (BCF > 1). It is expected as Cu and Fe concentrations in the soil were high. Moreover, these elements, Cu and Fe, are necessary for plant growth and physiology (Shuman 2004; Bose and Bhattacharyya 2008). Nevertheless, for the control sample, BCF values for Cu and Fe were lower than 1.00 except for leaves part of LC species (Fig. 3b). 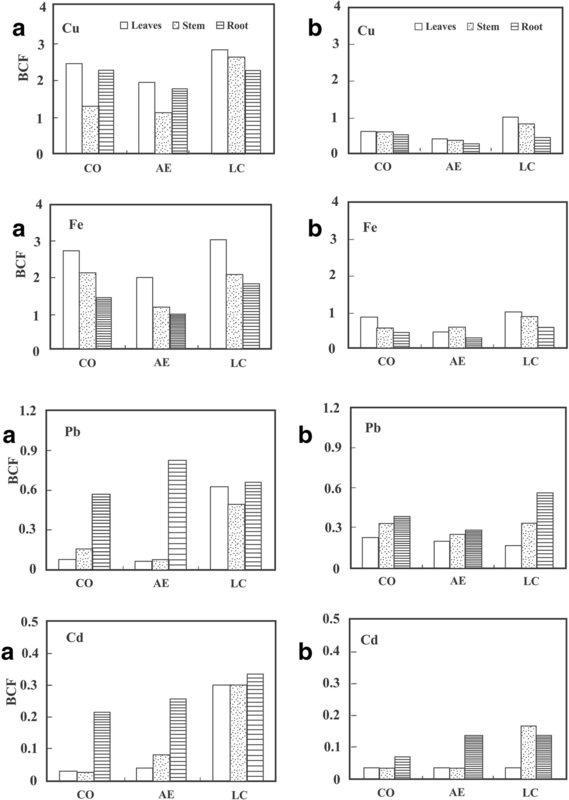 BCF values for Pb in the roots, stems and leaves of AE, CO, and LC were less than 1.00 (Fig. 3). These results have suggested that Pb bioavailability is low, and the plants can only absorb but do not accumulate it. The data for AE species from the previous study was limited; thus, this study tries to compare with other edible species. This finding agrees with previous studies on Oryza sativa by Liu et al. (2007) and Juen et al. (2014) but contradicts a study on CO species by Tanhan et al. (2007). Pb is relatively stable in soil (Khairiah et al. 2009). The presence of Pb in soil is due to natural soil deposits (Sulaiman et al. 2016). According to Juen et al. (2014), Pb has a tendency to bind with oxides of Fe and Mn in soils. Therefore, Pb may be available in the form of Fe oxides especially for the roadside sample (Fig. 3a) compared to the control sample (Fig. 3b). It is important to note that the roadside sample was collected from a suburban area; thus, the soil was likely to have received anthropogenic Pb originating from vehicles and other urban activities. Moreover, traffic density has a strong correlation with Pb pollution in roadside soils (Walraven et al. 2014). BCF values of Cd in all parts of all plants were less than 1.00 (Fig. 3). These findings suggest that all plants parts can absorb Cd and do not accumulate it. Plant roots seem to absorb more Cd than stems and leaves. This is in line with other study suggesting trace metals are retained in the lower part of plants (Bonanno 2013). Galal and Shehata (2015) reported high bioaccumulation of Cd in roadside plants closer to a road. Perhaps Cd uptake was correlated with organic matter (Zarcinas et al. 2004; Liu et al. 2009) as well as soil pH (Galal and Shehata 2015). The roadside sample has a higher BCF value than the control sample, as expected. The roadside sample was exposed to significant anthropogenic activities which possibly contribute to the increment of metal concentration in the soil and plants. Translocation ratios from root to stem and from stem to leaves were calculated for each metal. Figure 4 shows translocation ratios of Cd, Cu, Fe, and Pb in AE, CO, and LC species for roadside and control samples. Both roadside sample and control sample perhaps show similar TF trend. All plants have translocation ratios of metal below 1.00 from roots to stems except Fe. LC showed a translocation ratio of Cu slightly more than 1.00 from roots to stems. All metals translocate from stems to leaves more than that from roots to stems. This indicates these metals in the root zone transported weakly to the stem but somehow easily mobilized to leaves when they are available in the stems. For these four metals, absorption of the three plants had the rank: root > stem > leaves. Metals were transported weakly into the stems and leaves, and roots act as the barrier for the contamination. Due to a lack of previous studies for AE and LC species, the results were compared to other species. The results are in agreement with previous studies performed by Liu et al. (2009) on winter wheat, Liu et al. (2007) and Juen et al. (2014) on paddy plant, and Tanhan et al. (2007) on Siamese weed (CO). Perhaps different chemical properties of metal induce different accumulation and translocation capacity (Liu et al. 2009). It worth noting that plant could receive heavy metal from atmospheric deposition. Shahid et al. (2017) found that heavy metal could be absorbed by leaves directly from the air, however, depending on various factors. This includes the adsorption capacity and physical characteristics of the plant’s leaves as well as the plant species. In this present study, the findings suggest that the mobility of heavy metals from the soil to plant is equally important as the metal airborne absorption on the leafy part of a plant. Perhaps different location will have a different heavy metal accumulating ability. Besides, the local meteorological factors also could influence the heavy metal mobility such as precipitation trend and wind speed. The sampling point is not covered by other bigger plant species and surrounded by buildings, hence, affecting the metal absorption by the roadside plants. Plant roots are slightly enriched with Cd and Pb from the soil, while the leaves absorb and accumulate Cu and Fe. PCA shows that heavy metals originated from both anthropogenic and natural sources. Although this study may be limited in terms of sample size and sample collection time frame (dry season), it suggests roadside plant transport heavy metals from stems to leaves more readily than from roots to stems. This indicates that metals in the root zone are transported weakly to the stem but easily mobilized to leaves when available in the stems. A lab-based study could be possible ensuring the metal accumulation and transportation mechanism within roadside plants as well as ensuring the safe level if cooked (AE species) or used for medicinal purposes (CO species) by the local resident. Perhaps next study should also consider more roadside plant species, the influence of wet and dry weather seasons, and the concentration of metal in air particulate matter and watercourse nearby the study area. Comparison between direct metal airborne deposition to plant surfaces and metal uptake from soils also need to be considered. More comprehensive monitoring from various environmental medium probably enhances our understanding of the distribution, accumulation, and sources of metal in the tropical semi-urban area. We wish to thanks Universiti Teknologi MARA Cawangan Pahang for providing all necessary research facilities, especially the laboratory instruments. Special thanks to Mr. Mohd Fauzie Idrus for assistance in the GFAAS analysis and Mr. Joshua J. Stuart for assistance with the proofreading of this manuscript. Funding was provided by the Universiti Teknologi MARA Cawangan Pahang. Data collected and analyzed in this study are available from the corresponding author upon request. The first author (FRS) designed the study, conducted the data analysis, and wrote the manuscript. The second author (HAH) collected the sample and analyzed the sample. Both authors have read and approved the final manuscript. FAO/WHO WHO (Food and Agriculture Organization / World Health Organization) (2016) General standard for contaminants and toxins in food and feed. Codex Alimentarius International Food Standards. CODEX STAN 193-1995. Retrieved from http://www.fao.org/fao-who-codexalimentarius/sh-proxy/en/?lnk=1&url=https%253A%252F%252Fworkspace.fao.org%252Fsites%252Fcodex%252FStandards%252FCODEX%2BSTAN%2B193-1995%252FCXS_193e.pdf. Assessed 5 Sept 2017.